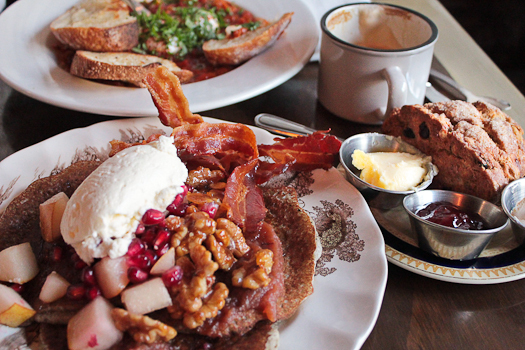 Brunch at Mile-End's Sparrow - The Sparrow - Shut up and eat. Do you like brunch? Of course you do. I don’t. Well, I didn’t, not until my girl turned me on to it. I used to think that the idea of brunch was for greedy people who woke up late one day and couldn’t decide whether they wanted breakfast or lunch and decided to meld the two together and have both.They inadvertently created a dish that had already existed to many people already who call this meal that breaks their nightly fast known as “breakfast”. Needless to say, I go out for brunch often. 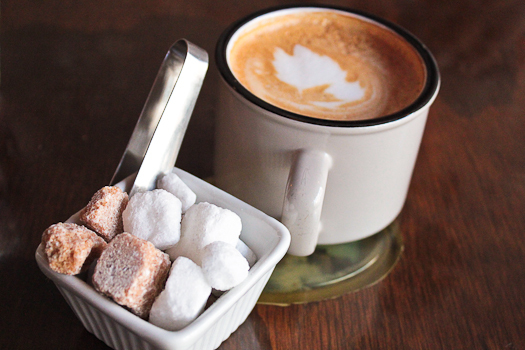 Can you think of anything better to do than to wake up early on a weekend to go eat? I didn’t think so. I recently went to this local spot that’s popular for their weekend brunch, Sparrow. This Mile-End British gastro-pub is a popular local hangout most evenings for cocktails and nouveau British cuisine. On weekends it’s a hot-spot for this aforementioned meal of greedy risers. It was my first time here for brunch and the place was happening. We had to wade through a sea of down-vest, yoga-pant stroller pushers and awkward casual first dates to be seated under a impressive powder blue wall print of flocking Sparrows. 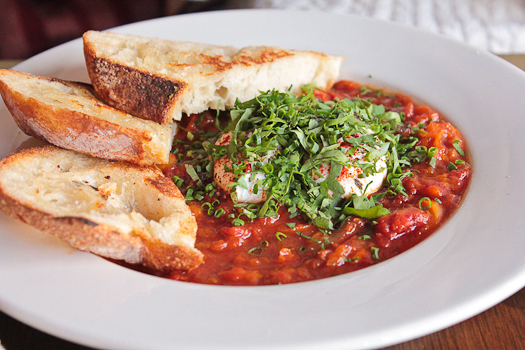 My girl ordered the shakshuka – two eggs poached in a Morrocan spiced tomato sauce with merguez, and feta served with sourdough toast. This smokey cumin spiced tomato stew was prickly in heat. Each mouthful was velvety and luscious when you managed to get a bit of the broken egg yolk in your bite. I’m used to eggs being poached directly in shakshuka, this version sees poached eggs precariously perched atop the the dish. I loved the bread. Toasted on the griddle and heavily buttered, each slice picked up the subtle nuances of flavours that was previously on the flat top imparting an inherent savoury aroma into the bread. 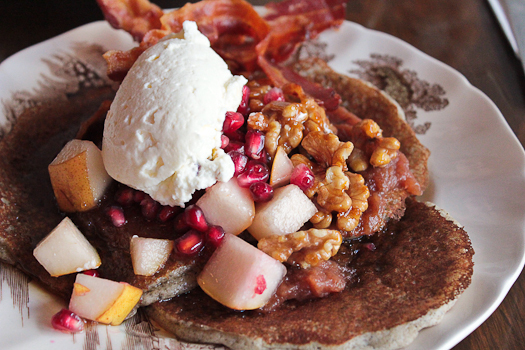 I had the buckwheat pancakes served with whipped apple butter, candied walnuts, maple syrup, bacon and seasonal pears and pomegranate. This dish was a clinic in textures and flavours and probably one of the better pancake breakfasts… I mean “brunches” I’ve had in a while. I usually like my pancakes fluffy and cake-like, these weren’t, but it didn’t take away from the overall enjoyment of the dish. The apple butter found itself succumbing to the gentle heat radiating off the pancakes and slathered itself over everything and filling the sweet and savoury voids between the fruits, woody nuts and bacon. It is essential to get a bit of everything in each bite, otherwise it just wouldn’t be right. I had a great experience at Sparrow for brunch. I’m surprised I didn’t visit sooner. Our scone was from The Cardinal Tea Room upstairs. Dense and buttery, the scone featuring dried blueberries was served with homemade jam and lemon curd. This place is definitely a brunch spot worth revisiting – if the pancakes and shakshuka are any indication of what we can expect from the rest of the brunch menu. House smoked trout with spinach and green onion pancake, soft boiled egg, beet salad, whipped crème fraiche? How about steak and eggs -strip loin steak, two sunny eggs, chimichurri, roasted potatoes, tomato and cucumber salad? I’d wake up early every weekend.